I must admit I’m going to be a little sad after the 10 days. I’m finding this plan for the most part easy to follow. The variety and not having to think about my meals makes it pretty easy. 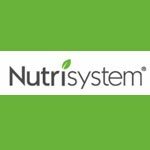 I’m so enjoying this Nutrisystem Review. However is one draw backs I’ve found with the plan. If your meals are all frozen meals it makes it a little tough when you are not home near your microwave for a meal. An example is when we went to the beach Sunday. I knew I would be eating lunch at the beach. There was no way for me to take my Nutrisystem froze meal so I had to improvise and take other items. For me I have to overcome that feeling of “not staying on plan”, which seems silly. I took some yogurt and a protein meal. 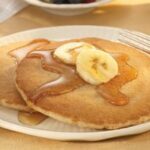 Today’s post however is about the breakfast meals. I’ve eaten four of the breakfast meals so far the Golden French Toast, Pancakes, Ham and Cheese Omelet, and Breakfast Burrito. I love that there is a variety as I’ve said many times I need variety to stay with something. Years ago my husband lost some weight and began working out and got in great shape and he ate the same thing 5 days a week. I don’t know how he did it. I was pleasantly surprised with the French Toast and the Pancakes. I chose to use the toaster to warm mine up rather then the microwave. I was afraid the microwave would make them a little soggy. 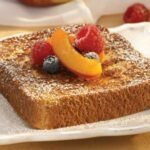 Of the two I liked the French Toast the best. Coupled with my glass of milk and 1/2 banana I thought these were both excellent breakfast options. The Ham and Cheese Omelet was decent. The hard part for me is I’m not much of an egg person and I can only stomach so many in one week (which is why it is good I have variety). 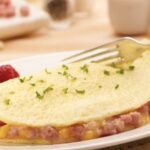 I think if I were going to eat a Ham and Cheese Omelet for breakfast I would prefer to make it on my own. However it in no way tasted bad. I really think this is due more to my taste buds then the consistency of the meal. The last item I tried was the Breakfast Burrito. 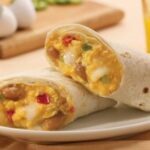 I really liked this a lot, it is not something I would ever think to eat for breakfast though I realize breakfast burritos are not a new thing. It was spicy and I loved the beans. Out of four different breakfast items I really enjoyed three of them that is pretty good odds if you ask me. I was wondering how the new meals tasted. I did Nutri system before they had all these new options. I think I would do better if I did it again, since their is more variety! I am really enjoying the food it is better then the food you get in the freezer section at the store. I know what you mean with that feeling of not staying on plan. That’s exactly the kind of mentality I have. As you know I am on the plan and I just want to mention that there are foods that are not frozen that you can combined with the frozen entrees and there are breakfast, lunch and dinner bars avaliable just not what you received with the 10 day challenge. I ate a peanut Butter and Jelly bar at the Beach this weekend. Yummy. Yep I plan to address that in my last post regarding my thoughts of the plan as a whole. That is definitely something I miss with just the frozen entrees. My problem is portion control. I do need to get more control over that and would be afraid these portions would still leave me starved, lol. The key, at least for me is to eat in between meals so the portion only has to last me a couple hours. I’m like your husband. I’d have better like eating the same thing every day. The frozen foods include some of my favorites! I LOVE the Salisbury Steak and Mac & Cheese Dinner – YUM! !